These days, when someone calls me on the phone when I’m at my desk, chances are I’ll take the call on my speakerphone, which happens to have a 27-inch Retina display and stereo speakers: in other words, my iMac. If you have a Mac running OS X 10.10 Yosemite or later, and an iPhone running iOS 8 or later, you can set them up to do the same as long as both devices are on the same Wi-Fi network. The first thing you need to do is to make sure your iPhone and your Mac are both signed into iCloud with the same Apple ID. On your Mac, you do this in System Preferences > iCloud; on your iPhone, you do it in Settings > iCloud. Next, on your iPhone, go to Settings > Phone > Calls on Other Devices and turn that switch on. Then turn on the switch for your Mac, which appears on the same Settings screen; if you have other devices that also use the same Apple ID for iCloud, and you want to make calls with them, you can enable those devices as well. With that out of the way, it’s time to make your Mac phone-friendly, and the key to that is FaceTime. Open the FaceTime app in the Applications folder and go to FaceTime > Preferences (Command-,) and enable Calls from iPhone. You may be asked to verify an emergency address for things like 911 calls; if so, go ahead. If all goes well, that’s it. Your Mac and your iPhone are now buddies as long as both are on the same Wi-Fi network: any calls to your iPhone’s number will also ring on your Mac — as well as on any other devices you have enabled to receive calls from your iPhone. In my case, any call to my iPhone also rings on my Mac, two iPads, and my Apple Watch, so I have a wide choice of answering options! When a call comes into my iPhone, a notification appears on my Mac from which I can answer the call, decline it, or send it to voicemail using the pop-up menu attached to the notification’s Decline button. 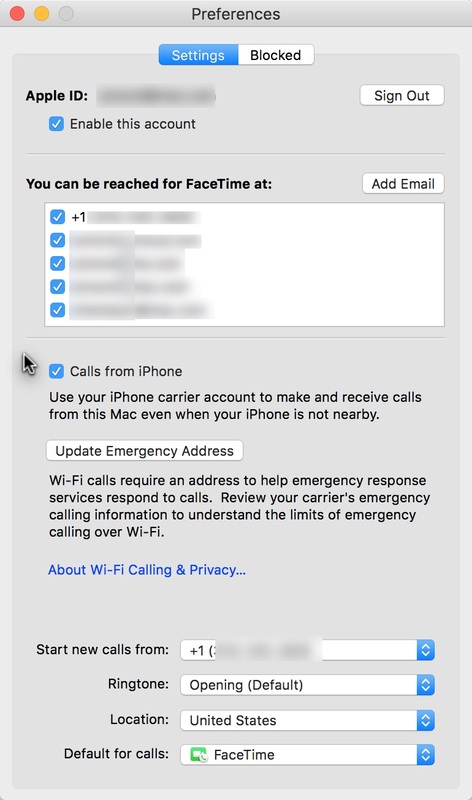 Note, though, for the Mac to receive calls, your iPhone has to be on (it can be sleeping) and within Bluetooth range of your Mac; that is, unless you have also enabled Wi-Fi Calling on your iPhone (Settings > Phone) and in FaceTime on your Mac (FaceTime > Preferences). Wi-Fi Calling works on any 2012 or later Mac running OS X 10.11 El Capitan, with the exception of the mid-2012 “cheese grater” Mac Pro, and an iPhone running iOS 9. In the United States, Wi-Fi Calling now works with all four major carriers: AT&T, Sprint, T-Mobile, and Verizon. 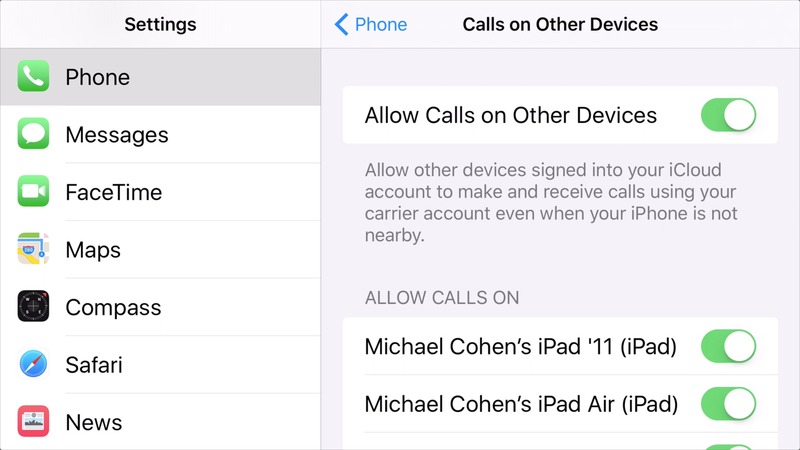 For more on Wi-Fi Calling, see “Turn on Wi-Fi Calling in iOS 9” (28 October 2015). So much for receiving calls. To make a call from your Mac, you have several options. One of the easiest is to use the Contacts app: go to the contact you want to call and then hover your pointer over the phone number. A blue phone icon appears to the right of the number. Click the icon and your Mac calls that number. If you see a phone number in an email message in Mail, a Web page in Safari, or a note in Notes, you can also use that number to make a call. Hover your pointer over the number, click to see the pop-up menu, and then choose the Call item. For those who are old-school and like to dial phone numbers manually, you can do that as well. Launch FaceTime and type the phone number into the FaceTime search field. The phone number appears below the search field with a phone icon to its right: click the icon and choose the number shown in the menu. FaceTime shows a notification as it attempts to make the call. Once the call connects, you can mute the call or end it from the notification, which stays on the screen as long as the call is in progress. And what if the number you call is an automated phone system that requires you to enter numbers (“Press ‘1’ for more…”)? Not a problem: make sure the FaceTime notification is selected and then enter numbers using the number keys on your Mac’s keyboard. So the next time you’re working at your Mac and your iPhone rings in your pocket, don’t fumble around for it: take the call on the big screen. I obviously had things set up this way on my phone but had no idea it was a feature…blew my mind the first time I answered a call from my iPad. By the way, here's a tip: if you answer a call on your Mac, you can transfer the call to your iPhone at any time — unlock your phone and tap the green bar at the top of the screen. And, since I know someone is going to ask, no, you can't do the reverse. Unfortunately, there is no way I know of to transfer a call in progress from an iPhone to a Mac. Great! What about faxing? If I can print to PDF and can use this phone, is there a way to connect those? If you have AT&T, you can use their NumberSync feature and make/receive phone calls even if your phone is on a different WiFi network or turned off. See http://www.macobserver.com/tmo/article/how-to-set-up-and-use-atts-numbersync for details. A real life-saver if you forget your phone at home, or if it runs out of battery. There is no "Calls from iPhone" setting in Facetime prefs on my Mac. It is a Mid 2015 iMac 27 running 10.11.4, and my iPhone is a 6S running iOS 9.3.1. I think there must be a step missing from your instructions, or something you have missed? I have done everything you suggest in your instructions to get it working. One area which I don't find very clear in your instructions is the question of how the iPhone and Mac talk to each other. You don't talk about Bluetooth pairing being required, and suggest that as long as they are on the same WiFi network it will just work. And you later say that WiFi Calling is only required when they are not in Bluetooth range of each other. I find all of this somewhat confusing and potentially contradictory, but then again it is possible that they do not require to be Bluetooth paired AND it is not necessary to have WiFi Calling on - but if so I do wonder how the magic connection happens! It would be great if you could explain this in a bit more detail. Bluetooth is required for Continuity, Apple's term for having your Mac and iPhone work together. Wi-Fi calling is an option only if your mobile provider offers it. Have you tried restarting your Mac and your iPhone? Have you made sure that Bluetooth is working on both devices? Are you sure that your devices are both signed in to iCloud using the same AppleID? Can you explain why there is no setting like you describe in my Facetime prefs on my Mac? It might help if you could do a screenshot of this setting on your Mac (which I assume is running 10.11.4?). On my Mac the prefs has a section for my AppleID (and a checkbox to enable it, presumably for use with FaceTime), a section that lists a number of aliases at which I can be reached for FaceTime, and then three pop-ups which do not control whether the iPhone is used or not. I understand that you have taken some of this from Apple's document, but it would be very helpful if you could include more detail than what Apple's article provides! There really is no extra detail to add: the steps I followed are the ones in the support piece. I have no idea why it is not working on your Mac. You can see my FaceTime preferences pane at http://tidbits.com/resources/2016-04/facetime-settings-phone.jpg — the phone setting really is just one checkbox. In my case, because I have Wi-Fi calling enabled via AT&T, the wording on the checkbox says that my iPhone doesn't need to be near my Mac. If your carrier doesn't provide Wi-Fi calling, or if you haven't enabled it, the wording is different, but it is still a single checkbox. If I get this linkage working to place and receive calls through the Mac or iPad, are there ways I can record the call? Either using Quicktime or something like Audio Hijack? I have never done this, and have to remind you that there are various laws that apply to recording telephone conversations. That said, this article at iMore - http://www.imore.com/how-record-phone-calls-your-mac - describes how to record telephone calls on the Mac. 1. You don't need to enable Bluetooth on the phone. The only Continuity feature that requires Bluetooth is Handoff. So, if you aren't using that or other features that use Bluetooth, you can save battery by leaving Bluetooth off. 2. Technically, "Same wi-fi network" is not exactly true. More precisely, same home network is required. The distinction is that the feature can work even if you are just using Ethernet cable to connect iMac to router; then, iMac can leave wi-fi disabled. For MacBook, since there is no Ethernet port, this distinction doesn't matter. 3. In addition to being logged into iCloud, you also need to be logged into FaceTime, on all participating devices - using same Apple ID. Scroll down to cellular section. While Apple says "same wi-fi network," iMac users can disprove that easily enough if they want to.